Here for a workout? A meeting? The Youth Fitness Zone is the perfect place for your child to hang out while you're at The J. There is no charge for Family and Single Parent memberships* to use the Youth Fitness Zone, but parents are required to remain at The J while their child is present. The J's Youth Fitness Zone features two distinct areas offering a variety of options for children ages 5-11. 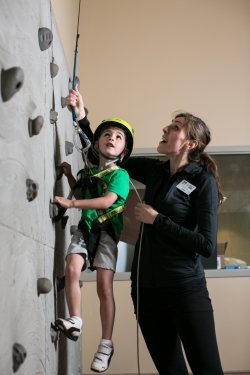 Children can drop-in and participate in a variety of staff led and supervised fun fitness activities including rock climbing, Kid's Strength & Cardio Circuit, and active games. Children can drop-in and hang out in the Loft of the Youth Fitness Zone where they will find fun foosball, pop-a-shot, or just relax with a book or puzzle. Good News for Bad Weather! On days when schools are closed in the Blue Valley or Olathe school districts, the Zone is open! Call the Member Experience Desk to ensure we're open on these days at 913-327-8010.